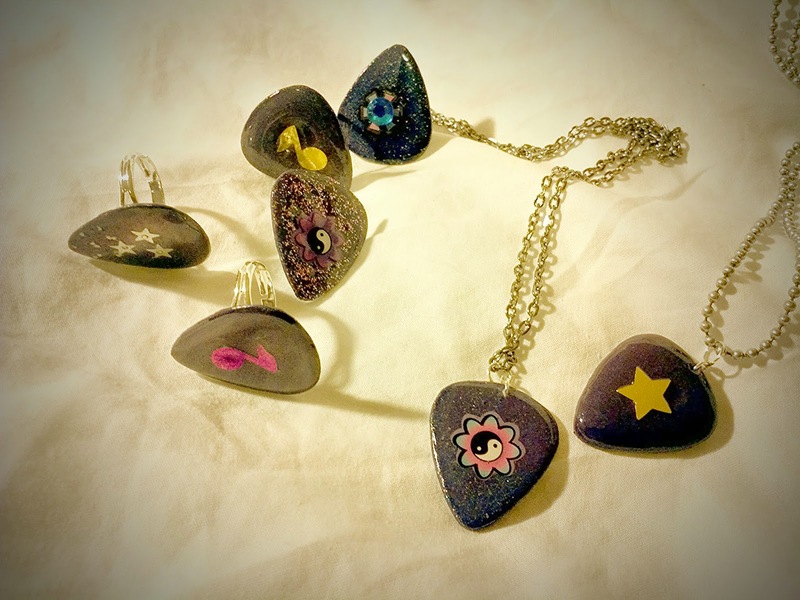 Now finished are my color changing guitar pick pendants! These are made with color changing nail polish by Digital Nails. It wasn't hard to forget how awesome mood rings were (and are) and I knew I wanted to make something just like that. After doing a lot of online research, I found that I needed a paint that is 'thermochromic' which will react to touch and temperature changes. Finding a paint or solution that changes to several different colors seems to be nearly impossible. However I found some great similar ways of doing it where I ended up being equally satisfied. Before long I found myself back at my trusty nail polish. If I haven't mentioned it before, nail polish has turned out to be the perfect paint to use for my guitar picks. There are so many colors and finishes; there's glittery, glow in the dark, an even color changing. My searching led me to quite a few options on Etsy, that's where I found Digital Nails. As soon as I got my polish I cracked it open and put it to work painting layers. Before long this creamy purple with tiny blue glitter turned icy blue from my touch! It was incredibly amusing, and great to see that it really did work. I made some rings, two necklaces and one pin. I have tested them all out and they all react to heat by turning light blue. These awesome pieces are not posted in my store yet.